This page allows a Citizen of the United Kingdom to purchase a Multiple Entry Tourist Visa for Benin. 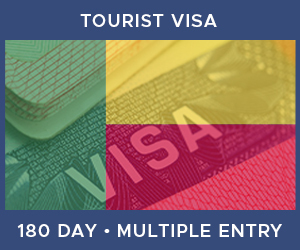 Valid For: 180 days The visa validity period refers to how long the visa remains active from the time that it was issued. Please ensure that you leave the country before the visa expires. Processing Time: : 6 business days The processing time is how long the visa would usually take to be obtained from the point at which we have received all the required documents to process your order. It does not include the time needed to post your document(s) to us or for them to be returned to you. In order to apply for a Benin Tourist Visa you will need to supply a number of items. Click on any of the icons below to learn more about each one. Passport with 1 year validity and 2 blank pages. You must have an up-to-date Yellow Fever vaccine in order to travel. You will need to go to your GP to obtain this. Find out more information here: https://www.nhs.uk/conditions/yellow-fever/vaccination.